The rush of anticipation moved the 6-foot-3, 331-pound Marcell Dareus to the edge of his first-class aisle seat on a plane bound for the Caribbean. During Haitian Heritage Month, Dareus can’t help but think about the humanitarian trip he made in February. Those images have stayed with him since he returned. Motivated by a deathbed promise to his mother, and the ability to provide financial support to a country still recovering from a devastating earthquake in 2010 and Hurricane Matthew in 2016, Dareus traveled to Haiti, the land of his father’s birth, for reflection and a sense of purpose. Dareus had much to reflect on. The deaths of his parents and his grandmother who helped raise him, all before his 21st birthday. The loss of his high school assistant coach and mentor. The murder of his younger brother. “After all of the things I went through, all I could think about while on that plane was my father and my promise to my mom that I would visit Haiti,” Dareus said. The trip developed after Dareus researched various foundations dedicated to helping the Haitians recover from the earthquake that killed more than 300,000 people and the subsequent outbreak of cholera. Dareus donated money to several organizations, including $25,000 to Hope for Haiti. According to its mission statement, Hope for Haiti works to improve the quality of life for the Haitian people, particularly children, through education, nutrition and health care. 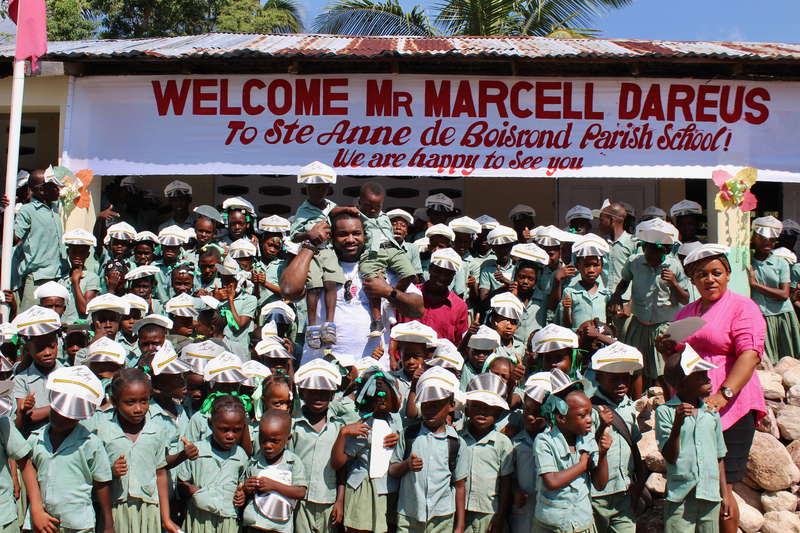 Marcell Dareus poses with students at the Ste Anne de Boisrond Parish School in Haiti. Dareus learned how Hope for Haiti, shortly after the earthquake, responded with relief that included distribution of medical supplies. The organization also provided support after Hurricane Matthew, a Category 4 hurricane, left widespread damage in southwestern Haiti. 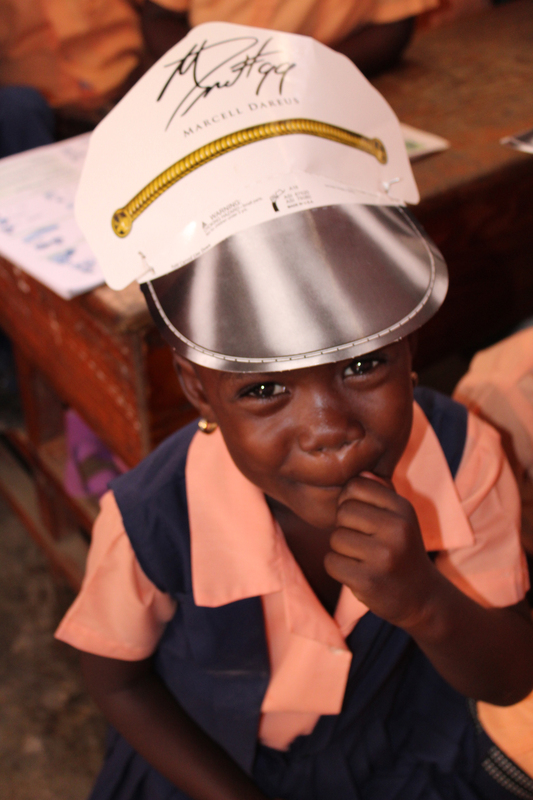 Hope for Haiti remains an integral part of Haiti’s recovery with regards to clean water, agriculture and education. Dareus landed in the capital city of Port-au-Prince, still in a daze that he achieved his goal of finally making it to Haiti. Stares from the locals greeted Dareus, mostly because of his behemoth stature, designer sunglasses and expensive necklace. And Dareus found himself staring right back. After making it through customs, Dareus began his four-day tour. He saw the earthquake’s devastation. Many buildings remained as rubble, and thousands of residents were displaced and homeless. But this visit was also a time for assistance and self-education. Dareus got the chance to see Hope for Haiti’s educational efforts as teachers continued to teach and children continued to learn despite the conditions. Dareus’ donation to the education efforts secured the teachers’ salaries for a year. He also toured a facility for senior citizens that is also supported by Hope for Haiti. 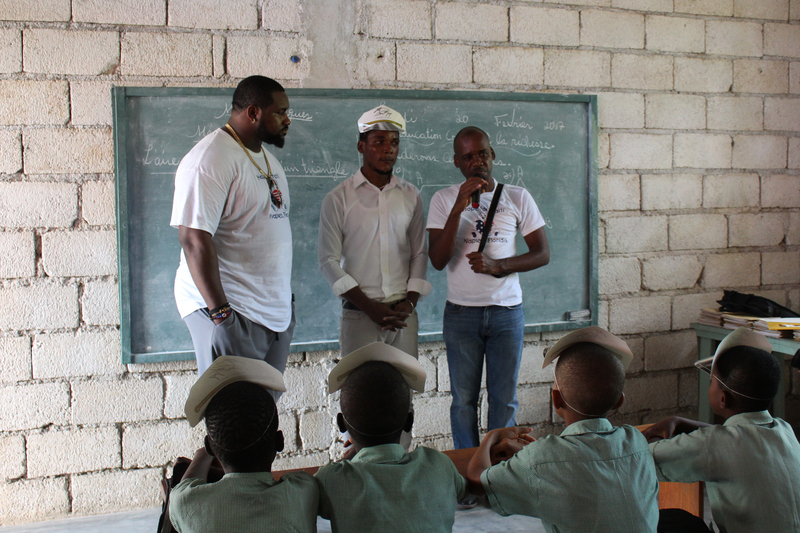 Marcell Dareus is introduced to a class of students at the Ste Anne de Boisrond Parish School in Haiti. Meg Orazio, Hope for Haiti’s director of program communications, said Dareus was immediately engaged with the residents. Dareus’ story began in Birmingham, Alabama, where he was born to Detroit native Michelle Luckey and Haitian immigrant Jules Dareus. Luckey had seven children, and she raised Dareus and his siblings without Jules Dareus, who died from prostate cancer when Dareus was 8 years old. Before Jules Dareus’ death, the family spent time with his family near Ybor City in Florida, an area populated by many Haitian immigrants, including Dareus’ father and uncles. Dareus’ grandmother, Ella Alexander, died of natural causes three years after Jules. She helped raise Dareus because Luckey spent years in a wheelchair with congestive heart problems. In high school, Dareus mourned the death of his mentor and assistant football coach, Scott Livingston, who died in a single-car accident. Dareus’ brother, Simeon Gilmore, died in a triple homicide in 2012, shot to death over a $40 debt. But the biggest tragedy for Dareus came in 2010, four months after his greatest performance and reward as a member of the Alabama Crimson Tide. While he was still in the glow of winning the national championship over Texas and being named the game’s defensive MVP, his mother died of heart failure nine days after Mother’s Day. Weeks before his mother’s death, Dareus spent time at her bedside. 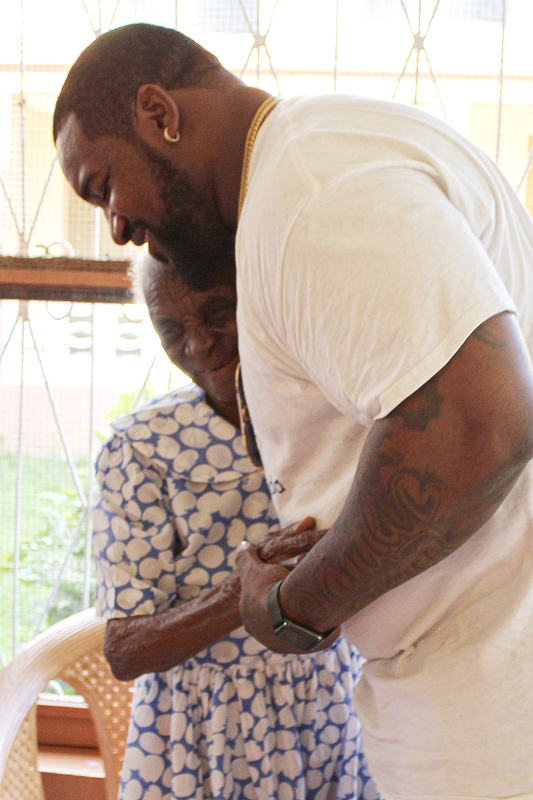 Marcell Dareus hugs a woman while touring Haiti. Dareus considers his mother his first coach. She taught life lessons. She disciplined the family. She was the motivator. One inspiring moment took place during Dareus’ final high school game. At the time, Luckey’s health rendered her bedridden, but to Dareus’ surprise she willed herself to watch him in person for the first time. Her presence near the end zone created a buzz in the stadium that ignited her son. The Bills drafted Dareus third overall in 2011. He registered 28.5 sacks in his first four seasons but had only two in 2015, his first season in former coach Rex Ryan’s 3-4 defense. Dareus improved to 3.5 sacks last season, but it was well off his career high of 10 in 2014. The Bills fired Ryan and replaced him with Sean McDermott, who will return the Bills to a 4-3 defense. The change could breathe life not only into the Bills’ defense but also into Dareus, who felt restrained in the previous scheme. Dareus has had troubles off the field as well. He was suspended for the first four games of the 2016 season after his second violation of the league’s substance abuse policy. His first violation, which resulted in a suspension for the 2015 opener, came after he was arrested in May 2014 in Alabama on charges of possession of a controlled substance and possession of drug paraphernalia. The following month, Dareus was charged with misdemeanors including reckless endangerment when he crashed his car into a tree during an alleged street race. The charges were dropped in a plea deal. If Dareus was not motivated enough in his efforts to help the homeland of his father and uncles, he was especially inspired by the rich history of Haiti. Bordered by the Caribbean Sea and the Atlantic Ocean, Haiti is on the island of Hispaniola, which it shares with the Dominican Republic. Christopher Columbus “discovered” the area when he landed on the island in 1492. Once the natives died off from European diseases brought on by Columbus’ occupation, Africans were imported and were enslaved. With the island under French rule, a slave revolt developed in 1791, but Napoleon Bonaparte sent troops and regained control for France in 1802. But another revolution erupted, and Haiti claimed its independence on Jan. 1, 1804. The tour led Dareus to the center of the city where the statue “Neg Maron” or “Brown Man” stands. It depicts a slave blowing a conch shell. He also holds a machete with a broken chain and handcuff. It is a symbol of slavery and freedom. The conch was used to call escaped slaves to gather while in hiding. Dareus crammed in as much information about Haiti’s needs and history as he could during his trip. Orazio said efforts like Dareus’ will help improve the future of Haiti because his contribution went beyond writing a check. The pride and rich history of Haiti is celebrated in May as Haitian Heritage Month. The celebration is an expansion of Haitian Flag Day on May 18, a patriotic day celebrated on the island and by the Haitian diaspora with various events that include parades, cultural activities and ceremonial flag-raising. Haitian Heritage Month was first celebrated in 1998 in Boston. It is popular in Florida, which has the highest percentage of Haitian natives. Dareus’ visit and participation was life-changing enough that another trip to Haiti is in the works, which will include some of his Bills teammates and his four children, who live in Alabama and range in age from 3 to 6. Bills teammate Jerry Hughes, the other driver in that alleged street race, saw the effect the trip had on Dareus. 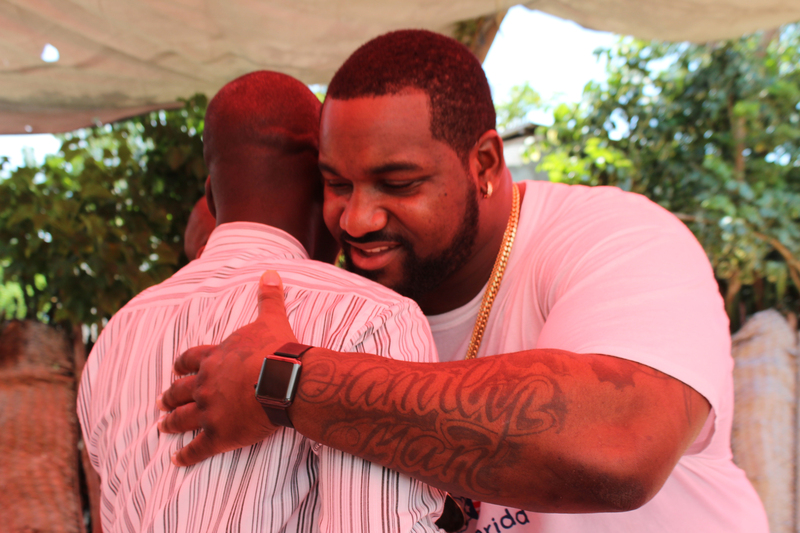 Marcell Dareus hugs a man while touring Haiti. Dareus, who signed a six-year, $108 million contract extension in 2015, lives with his bulldog, Diva, just outside of Buffalo, New York. The neighborhood children are comfortable enough to knock on his door to prove that a professional athlete resides on their block. Dareus often can be found cruising the streets of his neighborhood in a Mini Cooper, into which he somehow crams his hulking frame. Branson Wright is a multimedia sports reporter for The Cleveland Plain Dealer. He is co-host of The Sports Brothers radio show and a documentary film director and producer.